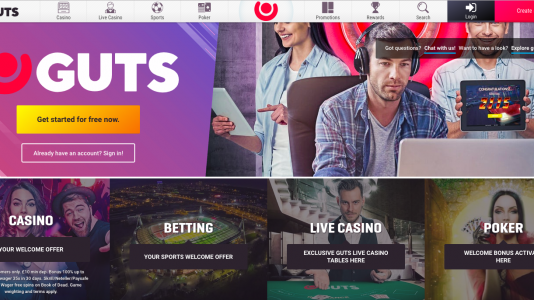 "Totally awesome casino - huge assortment of games"
Besides an excellent name, Guts has what it takes to knock out its competitors when it comes to taking care of its players. No reverse time, less than two hour payments, and no payout limits. There’s plenty of providers and games, such as Microgaming, Big Time Gaming, Pragmatic Play, Genii, Betsoft, Play n’GO, Edict, Yggdrasil, Evolution, Push Gaming, Red Tiger, Spigo and some exclusive and custom made GiG games. Honestly, Guts is not too bad of a place. But they have some serious issues with ID. They constantly bombard you with ID requests. Even after you are fully verified. They keep doing it time and time again. So I then closed my account their as I got sick of it. I was a depositor there for around 3 months. Deposited a lot. But I was getting ID requests every single week. It was just a total joke. So yeah I rated them a 2 for that reason. If they did not have the ID fiasco I would have rated them a 7/10 but they get a 2/10. Terrible. When I was playing there constantly had errors, rewards were next to zero, and just couldn’t get away with them. GIG have proven they don’t take data security seriously. Let spammers get access to my details, then lied about it on the forum. I was told around a year ago they would make a public statement about it on here (as I obviously wasn’t the only one affected), still waiting. Met him in person and he is just a top notch bloke! GUTS itself was fine in the beginning but have had experienced some serious tech issues in the past. Disconnects from slots and the famous MGS server errors. Besides that I cannot fault this place! Guts Casino Terms and conditions Apply. Besides an excellent name, Guts had what it would take to knock out its competitors when it came to taking care of its players. A truly solid casino operation. Highly recommended.